It’s only mild Encephalopathy; now can we stop worrying? I learnt as a fellow that infants whose maximum grade of HIE was Sarnat 1, or mild, had normal outcomes. I recognized that the data to support that were limited, but one of the best older studies was by my mentor and friend Neil Finer, who together with Charlene Robertson organised the follow-up at 3.5 years of 226 babies with varying degrees of encephalopathy. (Robertson C, Finer NN. Term Infants With Hypoxic-Ischemic Encephalopathy: Outcome At 3.5 Years. Developmental Medicine & Child Neurology. 1985;27(4):473-84). If we concentrate on the mild cases in that study, there were 79 who were evaluated for the presence of “handicap”; the definition of “handicap” used in that study included cerebral palsy of any severity, severe visual impairment or deafness, difficult to control epilepsy, or a score more than 3 SD below the population mean (100) on Stanford-Binet IQ tests. Using that definition, which picks out children whose condition has a significant impact on their lives, all the 79 mild encephalopathy cases were non-handicapped. In contrast all the severe encephalopathy cases were either dead or “handicapped”, and the moderate cases had about 1/3 prevalence of “handicap”. In those earlier studies Sarnat stage 1 refers to infants whose worst stage during their hospitalization was stage 1, children who deteriorate after the first few hours are not uncommon, and they would have been classified by their worst stage. A recent publication from McGill describes short-term outcomes and MRI injury among infants who presented with mild encephalopathy, the study doesn’t include long-term follow-up, but there were a number of kids who had mild encephalopathy at presentation who had adverse clinical or MRI outcomes. (Gagne-Loranger M, et al. Newborns Referred for Therapeutic Hypothermia: Association between Initial Degree of Encephalopathy and Severity of Brain Injury (What About the Newborns with Mild Encephalopathy on Admission?). American journal of perinatology. 2016;33(2):195-202.) In this study there were 50 babies who had mild encephalopathy on admission, were not cooled and had an MRI. There were also 13 who had mild encephalopathy who were cooled, mostly because of aEEG abnormalities. Of the 50 not cooled babies, there were 20, (40%) who developed MRI abnormalities, including some very severe abnormalities, one of whom actually died of complications of HIE. Many of the babies who had MRI injuries had a worsening of their clinical status over the first couple of days of life, and none of those who were mild but were cooled because of aEEG abnormalities had MRI injuries. Another fairly recent study from Parkland Memorial hospital described the short-term outcome of 89 babies who had acidosis at birth and were evaluated for the presence of encephalopathy. 69 of them had mild encephalopathy during the first 6 hours of life, (20 were normal) and of those 69 a substantial number had adverse short-term outcomes, which included later onset of seizures in 5, one of whom progressed to very severe findings and died of multi-organ failure. Others of them had feeding difficulties, persistent neurologic abnormalities at discharge, or abnormal MRI findings, for a total of 12 of the 69 with mild encephalopathy. The 20 with a normal exam were fine. Presumably, repeated encephalopathy exams would have found some progression in those who ended up with later abnormalities, and, of course, those with later seizures would automatically have been classified later on as having at least moderate encephalopathy. A study just published on-line in Pediatrics has further data, (Murray DM, et al. Early EEG Grade and Outcome at 5 Years After Mild Neonatal Hypoxic Ischemic Encephalopathy. Pediatrics. 2016). This is a very well done prospective cohort study, all the babies were examined within 6 hours of birth by a single pediatric neurologist, all had 24 to 72 hour EEGs and there was a prospectively enrolled healthy full term comparison group who also had EEG (but only for 2 hours for obvious reasons). 53 babies with HIE were included, and 30 controls, the babies had been born before 2006 and were followed up to 5 years of age. The encephalopathy grade finally assigned was determined on the examination at 24 hours of age, which might not have been the same as the 6 hour grade, and may not be the same as the worst grade either. The study shows a number of things, first of all the importance of having a comparison group. The comparison group had a Full Scale IQ of 117. So either the initial standardization of the test (WPPSI-III) no longer applies, or the controls were selectively of higher IQ than the Irish population, or (and this is my explanation) Irish babies are just smart. 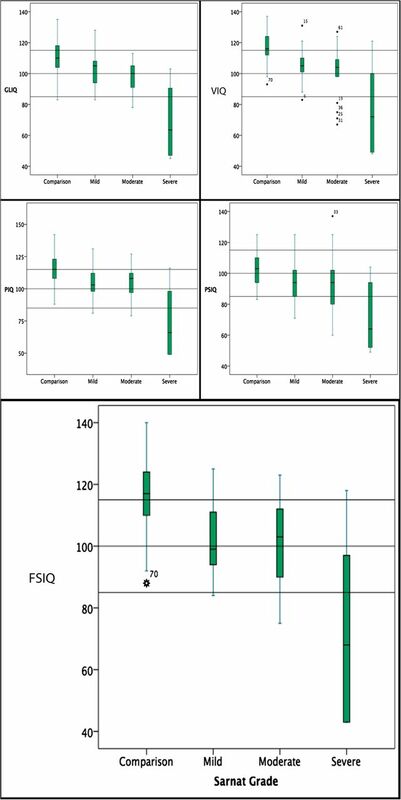 In comparison to the controls, the babies who were stage 1 HIE at 24 hours of age had lower IQ across all domains, and a mean FSIQ of very close to 100. A Worse EEG grade at 6 hours was associated with poorer outcomes, EEGs all tended to improve or stay stable at 24 hours, and the grade of EEG abnormalities was more predictive at 24 hours than at 6. So to summarize, infants who have stage 1, or mild, encephalopathy at 6 hours of age, when the decision is being made to cool them or not, do not have universally good outcomes. Many of them will have adverse outcomes, which can be predicted to some extent by: a later worsening of the clinical stage including later onset of seizures, or an abnormal aEEG or EEG, or persistence of stage 1 signs for more than 7 days (I didn’t talk about those data, they are older but appear reliable). When comparing outcome studies in this group it is therefore important to know whether they are referring to the worst grade of HIE, or the grade at 6 hours, or at some other time point. What to do about these babies? Starting hypothermia treatment later may actually have some effect, the 6 hour cut off that we use was rather arbitrary, and based on animal models with known timing and duration of the hypoxic ischemic insult and a fairly standard severe cerebral injury. Infants who have a mild encephalopathy and who start to deteriorate might therefore benefit from cooling started at 7, 8, 9 hours after insult. But I presume there must be a limit, once those neurones are dead they aren’t coming back to life. It seems that aEEG monitoring (and interpretation) for infants with mild encephalopathy is helpful in predicting which kids will progress to more severe short-term outcomes, according to, among other studies, the first study in this post, and in therefore deciding to proceed to cooling. If you can easily get a multi-channel EEG with expert interpretation as soon as the baby arrives, that is probably better than an aEEG. The approach we have generally taken at Sainte Justine is that if the baby’s exam is close to qualifying, and we aren’t quite sure, then we usually cool them. Therapeutic hypothermia has a very favorable safety profile, sometimes PPHN gets worse, (and we once had to terminate cooling at 60 hours because the PPHN became uncontrollable and the only other option was ECMO). Apart from that there are few complications unless the babies get too cold. Unfortunately babies with milder encephalopathy don’t like being cooled, they tend to seem uncomfortable, and often need some sedation which complicates their evaluation. I think we need an RCT. I thought I would surprise you with that one! Infants with mild encephalopathy at 6 hours of age could randomized to be cooled or not, and stratified according to the aEEG patterns. Infants with mild encephalopathy before 6 hours could be reassessed at 6 hours to ensure they hadn’t progressed, and to avoid cooling babies who recover. They will then need to be followed quite a long time I think, the incidence of long-term problems is low enough that the sample size will have to be quite large. I am still not sure that MRI findings are predictive enough of long-term outcomes that they could be used as a surrogate outcome (also known as a “biomarker”). I do think that if you found a positive effect of therapeutic hypothermia on MRI findings in mild HIE, that would probably justify more widespread cooling of mild encephalopathy; but if you found no MRI effect I think you would still need the clinical follow-up to be sure that there was no real benefit. 2 Responses to It’s only mild Encephalopathy; now can we stop worrying? From the research I assisted Paul Byrne with when I was in Edmonton some babies with abnormal MR scans will have normal outcomes at 2 years. The bad MR changes appear to be cortical highlighting and basal ganglia injury according to the Hammersmith group.